Brabantia have joined forces with WeForest to create a life changing campaign called “Love Nature”. Their plan is that every time Brabantia sell a Rotary Washing Line, WeForest will plant a tree in the barren desert lands of Burkina Faso. Their main aim is to populate the desert with the luscious greenery of 500,000 trees. This project will not only revitalize the tired and weary earth, but it will also create new homes for wildlife to flourish. Most importantly this development will lend a helping hand to the people of the Burkina Faso, so that they will have the chance to create a fresh new life for themselves and their children will hopefully no longer be deprived of education. So with our help they can bring life to the environment as well as the community, and as we all know, everyone deserves a brighter future. Why Take The Au Naturel Approach To Drying Laundry? We all know that fresh air is good for us, but why is it important to dry our clothes the natural way? Overall it’s better for your health. Force drying your clothes indoors produces moisture in the atmosphere, which isn’t good for you as the damp from drying your clothes on radiators can cause mold. Talking of electric, all of the energy that we use to force dry our clothes isn’t very friendly towards our planet. So, by drying our clothes with the power of good old fashioned wind, we are saving our planet’s natural resources as well as reducing pollution from power stations producing electricity. Force drying your clothes can cause shrinkages and nobody wants that to happen to their favourite jumper! So by drying your clothes naturally they get that little extra bit of TLC. We all love the smell of freshly laundered clothes, it makes us feel good, and why shouldn’t it? It makes us smell excellent! So let’s say good bye to cardboard jeans and let’s get keen on green. 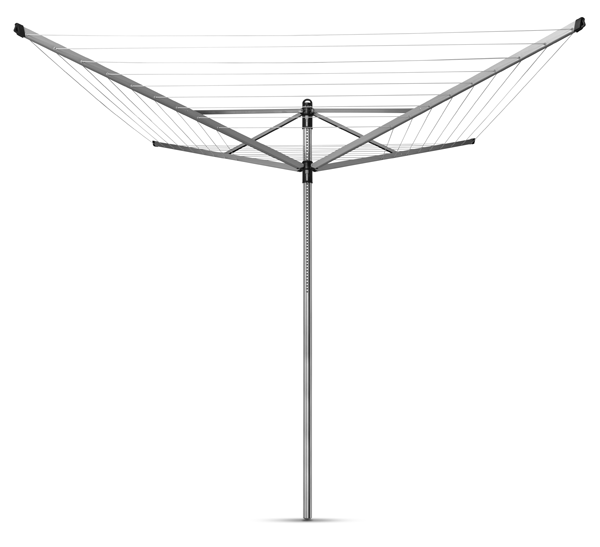 Drying your laundry really is easy breezy with the Brabantia Rotary Airer Top Spinner Washing Line. This particular rotary is very easy to use with its notable smooth rotating arms. Even with the heaviest of damp clothes and bed linen (that’s including hefty denim) this rotary will effortlessly turn without putting a strain on your arms or back. With the right weather conditions the wind can act as a gentle natural tumble drier causing the rotary to gently circulate whilst drying your laundry. So as well as saving money you are also saving the planet too! 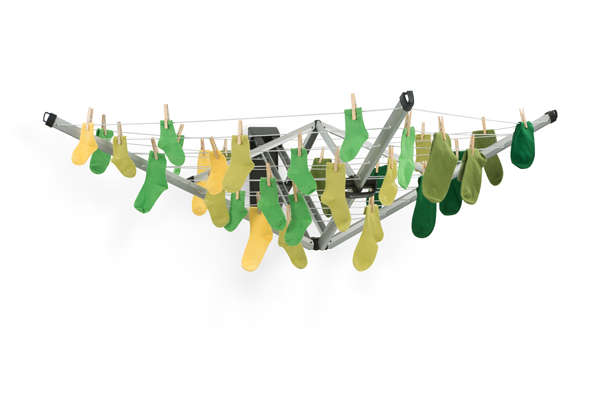 One of the most valuable features of the Brabantia Rotary Airer Lift-O-Matic Washing Line is that this particular airer has been designed specifically to adjust to the variations in an individuals or a garments height. Simply adjust the Lift-O-Matic system to your preferred working height. This will help you to avoid straining your neck and back and from breaking a sweat. Not only does this airer adjust with ease, it also rotates with the utmost comfort. You can now tackle your washing with a stress-free approach. 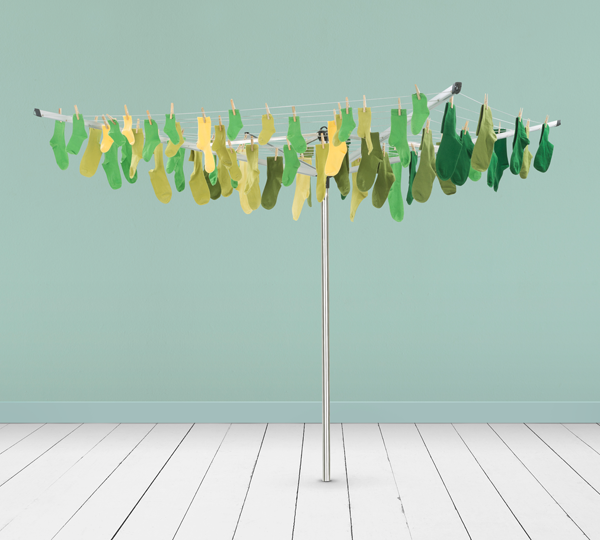 Plus you don’t have to worry about your washing slipping and sliding all over the place, as Brabantia’s washing lines have been adapted with non-slip properties, which is extremely useful in strong winds. 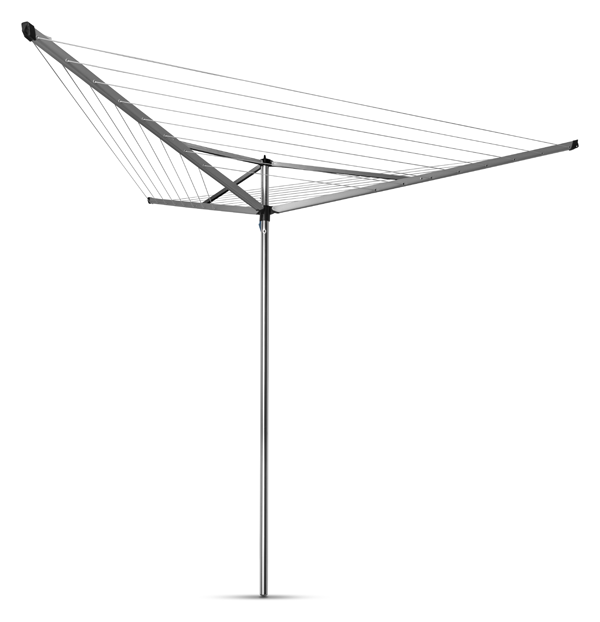 The Brabantia Wallfix Airer Washing Line has been designed to squeeze into the smallest of garden spaces. If you haven’t got the space for a full-blown rotary airer, or if you prefer an airer that you can easily hide away when entertaining family and friends, then the Wallfix Airer is perfect for you. Simply attach The Wallfix Airer to your sturdy garden wall and voilà, it is ready to use. What’s more, the Wallfix Airer can easily be operated with one hand making hanging out your washing a strain-free routine. Don’t be put off by the size of the Wallfix because this little airer has the strength to support even the heaviest of damp laundry. Please Note: The Brabantia Wallfix Airer does not rotate. So let’s start loving nature! Simply register your rotary with either ourselves or with Brabantia. Keep your eyes peeled for Brabantia’s television advert from the 20th of April! #Keen On Green, #Washing Lines, Brabantia, Laundrey, Love Nature, Natural, Rotary. Bookmark.